Laser Therapy is a safe and pain-free treatment which uses light energy to heal, the patient does not feel anything during the treatment. Unlike ultrasound, there is no thermal or heating effect with laser therapy, therefore you are not limited to a certain number of treatments and there is no risk of burning tissue whatsoever. For the same reason, persons with heightened sensitivity and metal or plastic implants can be treated without risk. Similarily, persons with pacemakers are able to be treated safely with laser. The wavelength, power and energy delivered determine the depth of penetration of the light and therefore the therapeutic effect. Our laser machine can penetrate tissues that are between 1 – 5cm below the surface of your skin. Most treatments take between 15- 30 minutes. Deeper target tissue requires more energy, and therefore a longer amount of treatment time per session. Phototherapy is “a therapeutic physical modality, using photons (light energy) from the visible and infrared spectrum for tissue healing and pain reduction” as defined by the North American Association of Laser Therapy (NAALT). 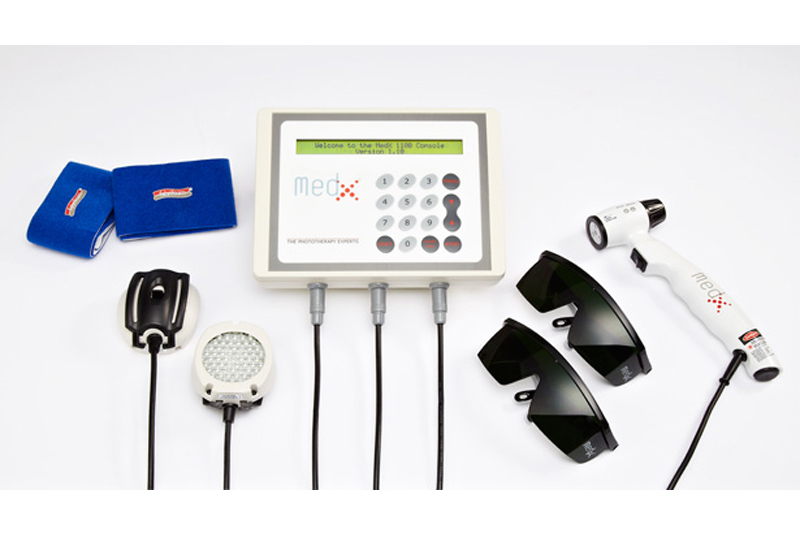 With Low Level Laser Therapy (LLLT), otherwise known as cold or soft laser therapy, low energy laser therapy or laser therapy, the therapeutic light energy can be produced by either LED (light emitting diodes), SLD (superluminous diodes, or super bright LEDs), or low level laser diodes. Light energy penetrates through the skin and is absorbed by the mitochondria of cells of all types. Light energy is converted into bio-chemical energy, restoring normal cell function.